Dr. Rick Elgendy (2014-15 Postdoctoral Fellow) is Visiting Assistant Professor of Theology at Wesley Theological Seminary. 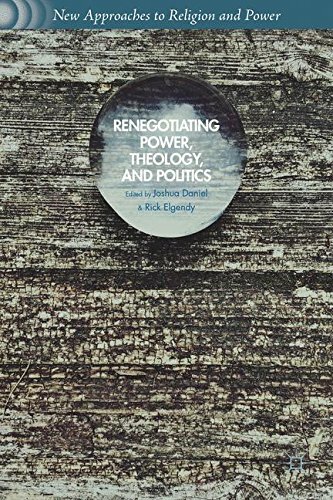 With Joshua Daniel, Rick is co-editor of a forthcoming volume on political theology:Renegotiating Power, Theology, and Politics. The Rev. Dr. Asa Lee is Associate Dean for Community Life at Wesley Theological Seminary. When our everyday discourse contrasts the “ivory tower” with the “real world,” it implies that the classroom is an artifice: a theoretical space of conjecture, set apart from the complexity and exigencies of ordinary life. This reputation is, in many cases, well-deserved. But a seminary – called as it is to address the needs of God’s people in the church and the world – cannot sit on the sidelines of the social struggle for justice. At Wesley Seminary in Washington, D.C., we have seen our community embroiled in the hurt and bearing witness to the healing of the last twelve months. As a public theologian teaching courses in theology and ethics, Rick Elgendy uses the classroom to encourage reflection on Christian conviction and action. This poses unique opportunities for reflective growth amidst social turmoil: the same week that protests erupted in Baltimore, his Christology course covered Kelly Brown Douglas’s The Black Christ, while his ethics class considered a speech from Jeremiah Wright. A range of understandings of race and “blackness” were offered by students from all backgrounds, many of whom were sorting out their personal involvement and complicity in social structures as they read the news with their developing theological lenses. As we together wrestle with the principalities and powers of our world, the seminary professor can facilitate a deep, honest encounter with challenging thought – even if only by listening, at times. As Wesley Seminary’s Associate Dean of Community Life, Asa Lee works to support students like Rev. Michael Parker II, who is currently the pastor of Ames United Methodist Church in Baltimore. Rev. Parker started at Wesley in the spring of 2011 seeking elder’s orders in the UMC and has always had a strong passion for serving urban communities, particularly his native home. Rev. Parker was childhood friends with Freddie Gray and currently lives on the same block as his family in the Sandtown community. When peaceful protests began in late April, Rev. Parker was a strong and faithful presence, helping protesters to understand the important social justice witness of the church and creating partnerships to address their righteous anger. As some of the protests turned violent, Rev. Parker became an important voice of reason and calm for much of the activity that was going on right outside his front door. As the violence escalated and the National Guard was deployed, Rev. Parker served as a community pastor that worked to help hurting people in his community deal with the unprecedented violence and responding governmental force. The entire time, this pastor was still trying to complete his studies at Wesley in order to graduate in mid-May. The unity of our lives means that our experiences will naturally flow into the classroom; the formation we receive – from sources we engage intentionally, like seminary, and unintentionally, like media – will shape our responses to the world around us. But it is still a central task and responsibility of those of us in seminaries to push ourselves toward those difficult questions about who we are and what we will do to transform the world. Time and again, we must remind ourselves that all theology is contextual theology, and our context demands our insightful attention.